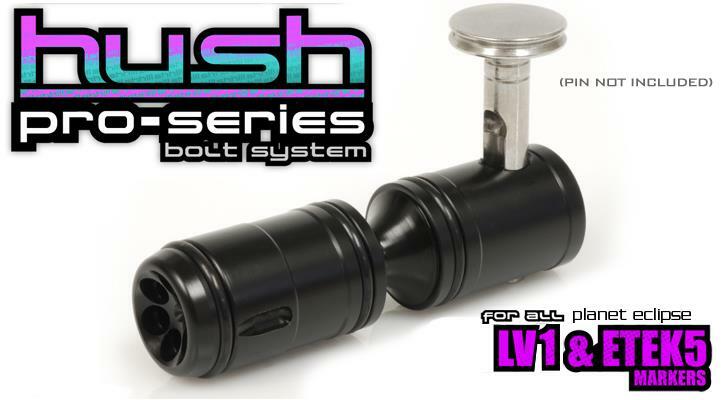 The Pro Series Hush Bolt is our latest bolt upgrade for the Planet Eclipse LV1, LV1.5, LVR and Etek5 paintball markers. The HUSH Bolt was designed to maintain peak efficiency, while also quieting the traditional sound signature associated with the stock bolt. In an effort to make the bolt better from the inside out, the HUSH Bolt is made from a higher grade polymer called 900 SP Series Delrin, which when machined with care, produces a smoother surface that exhibits decreased friction and wear properties. This means your bolt will maintain optimal performance much longer than other bolts, and not scratch near as easily. ***PIN NOT INCLUDED!! You will use your stock pin! Quiet Operation- the Hush Bolt was designed to have a less abrupt "pop" or "crack" that has traditionally been associated with "Ego" and "Etek" Markers. The TechT Hush Bolt produces a quieter, more muffled sound signature because the 6 little holes in the face of the bolt are perfectly sized to hit the ball with a "softer blast" of HPA. This design can also help cut down on breaking brittle paintballs in the breech... bonus! Radial Ramping Face Design- the Hush Bolt features a "Radial Ramp" on the leading edge of the bolt face which allows for less ball stack clipping, this means less broken paint in your breech...and less problems with bad paint. R.A.D.- Our "Ramp Assisted Detent" design is a groove specifically designed for the smoother operation of your delicate ball detents. The Hush Bolt actually can help prolong the life of your ball detents. Quiet Operation- the Hush Bolt was designed to have a less abrupt "pop" or "crack" that has traditionally been associated with the LV1 and Etek Markers. 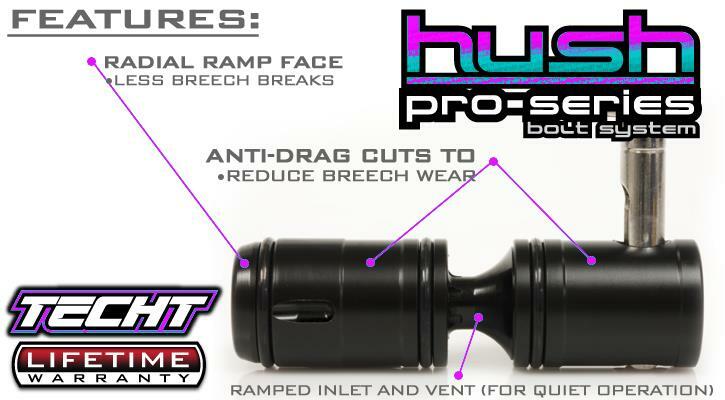 The TechT Hush Bolt produces quieter, more muffled sound signature because the 6 little holes in the face of the bolt are perfectly sized to hit the ball with a "softer blast" of HPA. This can also help cut down on breaking brittle paintballs...bonus! Radial Ramping Face Design- the Hush Bolt features a "Radial Ramp" on the leading edge of the bolt face which allows for less ball stack clipping. This means less broken paint in your breech...and less problems with bad paint. R.A.D.- Our "Ramp Assisted Detent" design is a groove specifically designed for the smoother operation of your marker's delicate ball detents. The Hush Bolt actually can help prolong the life of your ball detents.